In September 2015 Apple announced that sales of the new iPhone 6S had pushed past the 13-million mark for the smartphone's opening weekend. Even though pioneer Steve Jobs has shifted off this mortal coil, Apple users' love affair with their shiny iPhones shows no sign of fading. And though online casinos have traditionally had a frosty relationship with the App Store, there's never been a better time to play real-money slots on the iPhone. Slots on mobile smartphones look and play a little different to desktop games. The biggest issue is the screen size and the touch-screen interactivity. To make the games as playable as possible the reels are resized to fit the 5 or 7" screen. That means less room for the coin bet buttons and Autoplay settings. Each developer makes their iPhone slots differently. Some have reels that spin by "dragging down" the touch-screen. Others have Spin buttons that are set off-screen to one side. Coin bets, meanwhile, are changed via a drop-down menu, and Autoplay spins can be altered too. It's harder to multi-table slots on Apple phones too. If you're looking at working off a deposit bonus you'll find the going a lot slower on an iOS device. Once upon a time, it would be hard to find download casino apps for slots in the App Store, or on iTunes. Things are improving, however. In legalised jurisdictions iPhone players shouldn't have too much trouble finding apps to download to their smartphones. Slots apps offer a great range of games with an easy-to-use lobby specially designed for the iPhone. Secure payments can be made at the mobile Cashier too. Some native apps can also be downloaded from the casino site direct. Alternatively, slots can be played via a browser like Safari. Loading games simply needs a username and password. In fact, iPhone players can use the same login details as they use for their Mac OS version. No-download games and casinos work using Flash or HTML5. In fact, with Apple's long-term problems handling Adobe Flash, it's best to sign up to mobile casinos that work solely in HTML5 or Java. No-download iPhone slots work in a browser window that's more like a separate website. An up-to-date browser is advisable, as is a solid WiFi connection. Much is made about the swanky new iPhones but even older iPhone 3s can handle some games. Mobile casino sites will usually list the minimum requirements, but anything over iOS4 is good enough for a lot of games. If you are on a 3G/4G network, make sure your data plan can handle the games. Slots can take up 100kb or so every time you open a browser. If you're playing thousands of slots a month that data package can take a real hammering. If you're using a good browser for iPhones, like Safari, make sure you have the latest version downloaded. If you're using iTunes for apps, you might find gambling apps hard to come by. Several jurisdictions have banned outright gambling apps from being stored in iTunes or the App Store. However, with most download native apps accessible direct from casino websites, this isn't usually a problem. Just visit your preferred slots site and download the iOS app, if available, from there. A major disadvantage of iOS slots is the game selection. 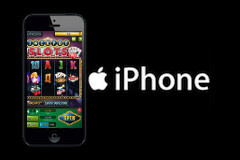 You may find a much-reduced selection of iOS slots at a mobile casino compared to a desktop one. Some of the functions of your favourite games may differ too. And progressive jackpots on some iOS slots can be far lower than the same games on a desktop casino. Even if you live in a country where online gambling is permitted (like us in the UK), some mobile providers will block your access to casinos. If you find that's the case, a simple call to your mobile provider is enough to get gambling sites unblocked. Losing web connection on an iPhone can be a pain. Whether you're on a dedicated app or an instant-play site, you need to ensure your WiFi connection is solid. Alternatively, have a good 3G or 4G connection if you're on the move. Most sites will restart your slot in the place you left off if you are disconnected. No-download games for iOS can only be played in Chrome, Firefox or Safari browsers. It's worth downloading ALL the available browsers for the iPhone. This way, you can have a couple of back-up options in case one casino fails to open.